The #1 reason for receiving the 'too far away' error: Your device thinks you are too far from the Location you're supposed to be covering. Your device IS accurately reporting your location, and you AREN'T actually close enough to your work location. Your device is NOT accurately reporting your location, and you ARE, in fact, close enough to your work location. Your device is working and you're on location BUT the location hasn't been entered correctly, doesn't exist in the system, or hasn't been assigned to your Shift. #1 happens when you actually need to be closer to your work location. Ideally you should be on location and ready to Clock In with plenty of time for your device to report your current location through the Inteliguide app before attempting a Time Punch. This also applies to any other Time Punch for Lunches or Clock Out. #2 is frustrating. This error can happen in some circumstances even if you know you're at the right location. The Inteliguide app asks your device for the most accurate and most recent location information, but the accuracy of that location information is ultimately handled by the device. Anything from battery levels, to cell, data and GPS reception, to the type of data access you're using (LTE or 3G data vs WiFi) can impact your reported location accuracy. Sometimes it's as simple as waiting for the device to update the Inteliguide app with your current location and trying again. See below for an example on using the map to reference where your device THINKS you are compared to the location marker(s). #3 is very frustrating because you may not have any control over how your shift is configured. For example, you know you're on location, and your device is reporting your location accurately according to Google or Apple Maps, and/or the map in the Inteliguide app itself, but the location record that your Time Punch is being compared to is wrong and appears miles from where it should be; or doesn't appear at all. This can happen when an address is incorrectly geocoded, meaning that the address may be correctly entered in the system, but the location "fix" (longitude and latitude point) is not accurately representing that address. This can also happen if your location hasn't been added to your Group shift, or doesn't even exist in the system at all (if you Clock In and start patrolling from your house, for example, it may not have been entered into Inteliguide). We introduced Settings that allow Admins to set the distance proximity within which officers are eligible to make a Time Punch. As part of those new settings, we turned on the Geofencing check for Shifts made for Groups as a default. This has caused many patrol officers that are used to Time Punching from their homes or offsite and away from any actual Service Location to suddenly start receiving the 'too far away' error when attempting to Clock In or Out. Check out Settings below for a quick reference on how to turn that off. Maintaining good Account conditions to ensure the most accurate and best usage of Geofencing takes some attention. Whenever new Locations get added, and new Shifts created, there is the possibility that you may, in conjunction with your Geofencing Flexibility Settings, cause yourself or an officer to be denied a Time Punch. That's where the 'too far away' error message pops up whenever the affected User tries to Clock In or Out. Of course, even if your settings are perfect, and perfectly accurate, there are still conditions beyond your control, an officer's control, or our control. Those issues usually have to do with the accuracy of the devices the Time Punches are being attempted from, or connection conditions ranging from atmospheric to public or provider maintained location data stores (IP or WiFi based location fixing), to equipment malfunction or glitches. Before diving into the troubleshooting steps, it may be that some managers would rather just avoid the hassle of troubleshooting. They can easily do this by setting their Geofencing Settings to allow Time Punches from anywhere for any Shift/Group/Location. 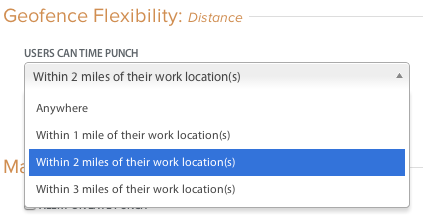 Navigate to Manage -> Settings -> Payroll and scroll down to the Geofencing Flexibility section. Set the 'User Can Time Punch' setting to 'Anywhere'. Uncheck the 'Geofence Shifts Created for Groups' checkbox. Alternatively, just uncheck the 'Geofence Shifts Created for Groups' checkbox to expand the Time Punch ability to your patrol officers. Read below for some other steps you can take as an Admin to avoid this. Note: Adjusting these settings requires an Admin User Role. Patrol officers should be working Shifts created for the same Patrol Groups they'll be patrolling in Patrolguide. We've encountered some situations where officers were scheduled to work a Shift made for one Location, even though they were actually being scheduled to work patrols in Patrolguide covering many widespread Service Locations. You can fix this by scheduling them to work Shifts created for the very Patrol Groups they're supposed to be working in Patrolguide. Make sure all relevant Service Locations are added to the Groups their Shifts were created for. If officers are working Shifts for Groups, Inteliguide will systematically try and check their proximity for any of the Locations belonging to the Groups. So if you have the 'Geofence Shifts Created for Groups' checkbox checked in your Settings, you'll want to make sure any Location an officer may be trying to Time Punch from is included for consideration. For those Patrol Officers that start/end their day away from any of the Service Locations, you can add their homes or anywhere else they may plan on Time Punching from as Location Accounts in Inteliguide, then add those Locations to the Groups they're scheduled to work. To reiterate if you don't want to turn off the restriction for Shifts made for Groups, EVERY Location they attempt a Time Punch from must belong to the Group the Shift was made for. If any are missing, that could cause the 'too far' error message. Turn off Geofencing for Shifts Created for Groups You can uncheck the 'Geofence Shifts Created for Groups' checkbox in Settings (mentioned above). This will solve many problems related to Steps 1 & 2. Expand the proximity range. The default setting is limited to 2 miles. Consider expanding it to 3 miles to troubleshoot 'too far' issues. Double check Service Location Address geocoding accuracy. This is a big one. If you have any Locations that are either not geocoded (this can happen for a variety of reasons), or you have Locations that haven't been geocoded accurately, that could greatly affect the experience of officers trying to Time Punch in the field. The Service Locations in Inteliguide must be accurate. You as an admin can double check this by going to the Location details pages for any of your Locations and double checking what you see on the mini map with what Google Maps full web app (https://www.google.com/maps) reports for the known actual Service Address for that Location. Sometimes even a wrong Zip Code can throw off the saved long/lat values in Inteliguide for any given Location. We're at the mercy of Google's API for that, but it can usually be fixed by typing in the corrected information you can grab from the full standalone Google Maps web app. One trick we recommend is to just type the Street Address and State to get the full Google Maps web app to verify and return the correct City/Zip. You can play with this, alternatively entering the State, or the City, and leaving out the value that you want Google to confirm. You can then type that corrected info into Inteliguide and trigger a re-geocode event when you SAVE the record. Sometimes what you get from a client, or type into Inteliguide isn't quite right. Other times everything is right, and the geocoding API just isn't reporting an accurate position. In some cases, Service Locations can have Addresses that don't yet exist in Google's data, either for their full web app, or the API that Inteliguide uses (a new construction site and brand new address, for example). Spoof inaccurate or missing addresses. This means finding a nearby Location that Google is aware of, and can geocode through their API, and using that for the Service Location until Google's data is up-to-date enough to consider your actual Service Address. This is a last ditch measure, but works in a pinch. Just remember to notate the actual address for any officers, and entrust that information to reliable officers that can remember to work the correct address once they've navigated to the alternate address. Check the device location. If they're using a desktop or laptop with potentially inaccurate location fixes (via IP address or WiFI, for example, as opposed to fine GPS), then they can determine where their device thinks they are on the map using a new Google Maps feature. Turn off location sharing in the browser (settings are different for each browser). If the location fix their device is reporting in Step 1 is way off, they can simply stop sharing their location. The system will ignore the geofencing check but will feature no long/lat info for any subsequent Time Punches. Make sure the mobile app is sharing their location. If they're using the mobile app, they must be sharing their current location and their location fix must be accurate. If they've denied location sharing on their iPhones, they need to uninstall and reinstall the app, and grant permissions when they log in again. They can check their location fix (where their phones think they are) by using the Google or Apple Maps apps on their smart devices to verify their positions before attempting another Time Punch. In a perfect world, everything would synch up, but there are many things that are beyond our control when it comes to GPS or other location fixes through devices, so lifting the restriction may help you discover if the problem may be from officer devices, or Shift Group Location members, or Location geocoding. If many officers with different devices are reporting similar problems surrounding shifts for a particular location or group of locations, it's a better bet that the problem lies with the location or group configuration. The devices we use for testing sometimes report us miles away from where we are, depending on the quality of our connections. So an officer standing on location may experience their devices reporting them miles away. Sometimes it's as easy as waiting for a better GPS fix (course to fine, which the app will accept either). Sometimes we have to turn on our WiFi to allow better location accuracy through the mobile browser, this is because a network data signal can sometimes report way skewed positions (once putting me in Minneapolis while I was in our office). Consumer devices like smartphones are variable, desktops/laptops even more so, and that's why we allow for your settings to be modified to account for this and help you troubleshoot any issues that arise with your account locations or devices. You can use the Shift Details page for any Shift as a diagnostic tool in determining the state and location quality of the assigned officer's Time Punches. You'll see successful Time Punches in the top right section of the Shift Details pages under the 'Time Punches' header. If the Time Punches are underlined as a link, that means that the location information shared from their devices was accurate enough to be included in the request. If the Time Punches are not underlined as a link, that means that either the officer wasn't sharing their location through their device, or their shared location was so inaccurate that Inteliguide threw it out. Inteliguide throws out location data that has a course accuracy rating of more than a kilometer. This is often what happens with IP and WiFi address location fixes (as opposed to GPS). Clicking on the Time Punch links will highlight the Time Punch positions (as reported through their devices) next to any Service Location markers for the Shift.